Do you have a passion for wildlife, and do you enjoy watching birds? Are you also hopeless at identifying some of the more difficult ones? Do you feel lost without a field guide, and can you count on both hands the number of birds that you can identify by their calls alone? If the answer to these questions is yes you are not alone. In 'Winging it: Birding for Low-flyers', Andrew Fallan recounts the highs and the lows, the trials and tribulations, of being an avid birder in a world seemingly populated by experts and high-flyers. 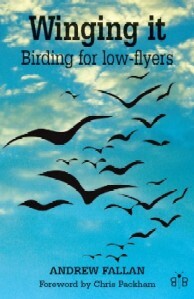 All those with an interest in birds and other wildlife will identify with and enjoy these engaging tales. Hence, they are invited to join an often humorous and irreverent journey around the U.K.: from the heavily industrialised Thames estuary to Minsmere and the north Norfolk coast, from the Scilly Isles to the majestic scenery of Wales, all the way in fact to the rocky grandeur of the highlands and islands of Scotland. Against the backdrop of our green and pleasant land, the author examines, through his own experiences, the often spectacular beauty of our wildlife, and encourages us to seek solace in the simple enjoyment of birds. I still harbour a fascination with birds of prey, and among my most treasured birding memories are my sightings of these spectacular creatures: Red Kites wheeling over the wooded valleys of central Wales; Goshawks soaring menacingly over the Forest of Dean; White-tailed Eagles spreading their enormous wings against the majestic backdrop of the Isles of Skye and Mull; Montagu’s Harriers performing a mid-air food pass over the nest in the arable fields of Norfolk; and a crazed Merlin striking terror into a group of small birds freshly put to flight by a beautiful male Hen Harrier, marauding like a silver phantom across the winter wasteland of the Isle of Sheppey in north Kent. Later that night I lay in my bivvy bag, my head poking out into the cold night air. Beyond the faint silhouette of the ridge high above, the skies were filled with thousands of stars, all twinkling bright against the deep inky blackness beyond. And as I lay there utterly mesmerised, as if to remind me that the show wasn’t quite over, a shooting star streaked across the night sky, leaving a sparkling trail of silver in its wake. This place was quite simply spellbinding. On our way to the upper valley, we were treated to a spectacular display by two Ospreys as they flew in close proximity to the minibus, almost seeming to follow us. Then, as if waiting until its audience was in prime position, one of these birds started to hover and, with wings pulled back and talons pushed forward, suddenly dropped out of the sky, plummeting vertically down towards the winding river and out of sight. A few moments later it re-emerged, victorious, with a fish in its talons and continued its flight up the valley, stooping its head every so often to take a nibble from its slippery prize.